The NYPD Has Disbanded Its Most Notorious Spy Unit, but Is the Age of Muslim Surveillance Really Over? Many worry that the architecture of NYPD’s surveillance system remains largely intact. The Damascus Bread and Pastry Shop in downtown Brooklyn has the same unassuming storefront as it did in 1930 when Hassan Halaby, a newly arrived immigrant from Syria, opened it at the height of the Great Depression. It was one of the first Arab-run businesses on Atlantic Avenue, a street that quickly became a renowned cultural hub for immigrants from the Middle East. Three generations later, Halaby’s grandchildren run the family business catering to the area’s now multi-generational Arab-American community as well as newcomers to the neighborhood. For New York City’s sizable Arab and Muslim-American populations, the Damascus Bread and Pastry Shop is the perfect respite for a taste of home: plastic bins of multi-colored olives line the walls of the shop, while jars of tahini stack the shelves and tubs of hummus stock the refrigerator. For the New York Police Department (NYPD), however, the Damascus Bread and Pastry shop is a “Syrian location of concern” that needs to be monitored for possible terrorist activity. For the past twelve years, this has meant that undercover police officers with the Zone Assessment Unit—a stealth NYPD outfit charged with mapping and spying on Muslim communities—have periodically posed as customers, chatting up business owners about US foreign policy in the Middle East and other topics designed to root out would-be terrorists. They then recorded anything and everything in a police file. On April 15, Police Commissioner William Bratton announced that the NYPD was disbanding the Zone Assessment Unit, formerly known as the Demographics Unit. The announcement came one week after community activists, including Linda Sarsour of the Arab American Association of New York and Fahd Ahmed of DRUM-South Asian Organizing Center, met with the recently appointed police commissioner to share how the NYPD’s policies had affected their communities. Many have heralded the demise of the Zone Assessment Unit as a victory for Muslim communities, and in many ways, it is. After years of Muslim community organizing, grassroots activism and lawsuits against the city, the police department finally seems to be listening, perking its ears to the concerns of its constituents. “In our organizing, we are pressuring the NYPD to change its own policies—we see this as one step in this direction,” said Fahd Ahmed, who serves as legal and policy director of DRUM, which has been at the forefront of the organizing against the NYPD’s surveillance program. Yet, as much as the demise of the Zone Assessment Unit signals a step in the right direction, many Muslim community members question how significant the move really is. They worry that the change is more cosmetic than actual, a splashy declaration that obscures the way surveillance continues by other names. And after more than a decade under the NYPD’s watchful eye, who can blame them for the suspicion? For Ahmed and others, the biggest concern is that much of the architecture of the NYPD’s system remains intact. Though controversy has made the Zone Assessment Unit the most visible prong of the NYPD’s surveillance apparatus, it is hardly the only part of it. Other methods and mechanisms continue to exist, including the Terrorist Interdiction Unit, which monitors all mosques within 100 miles of New York City, designating at least a dozen as “terrorism enterprises,” while actively sending informants to eavesdrop on sermons and conversations of attendees. Moreover, there has been no meaningful conversation about limiting or regulating the use of surveillance, particularly of informants from other units which have created a climate of fear and suspicion in these communities. Even if all of the NYPD’s covert surveillance tactics—such as the practice of sending undercover officers into businesses and informants into mosques—were abandoned and replaced with honest conversations with community leaders, the issue of faith-based religious profiling of Muslim communities would still remain. First named the Demographics Unit, the Zone Assessment Unit was formed in 2003, not long after the September 11 attacks on the World Trade Center. Desperate for an intelligence unit that could stave off another terrorist attack, the NYPD teamed up with Central Intelligence Agency veterans to create its own mini “Langley on the Hudson.” The unit was first tasked with mapping New York City’s entire Muslim population, as if to suggest that the mere facts of faith, dress, background and tradition made a person suspicious in the NYPD’s eyes. The unit began its work with a file of twenty-eight “ancestries of interest,” ranging from Arab ethnicities like Palestinian and Syrian to heavily Muslim populations from former Soviet states such as Chechnya and Uzbekistan to Black American Muslims. From there, undercover officers worked to find where these communities were concentrated in the city, posing as customers in Muslim-owned businesses ranging from Middle Eastern grocery stores to otherwise nondescript shops that happened to be run by a Muslim. The Zone Assessment Unit became public knowledge in 2011 after investigative reporters Matt Apuzzo and Adam Goldman, then of the Associated Press, leaked the NYPD’s internal documents in a series of Pulitzer Prize–winning articles that revealed the full extent of the NYPD’s surveillance operation. The documents showed that, in addition to compiling in-depth information about Muslim-owned community businesses, undercover police officers had been attending Muslim Student Association events and community rallies, joining sports teams and renting apartments that would get them closer to these communities. In over ten years of operation, the NYPD’s Zone Assessment Unit did not generate a single terrorism lead or investigation, the NYPD has acknowledged. Yet, if the surveillance operation didn’t deter any terrorist attacks, it has been devastating for the communities snared in its Big Brother gaze. 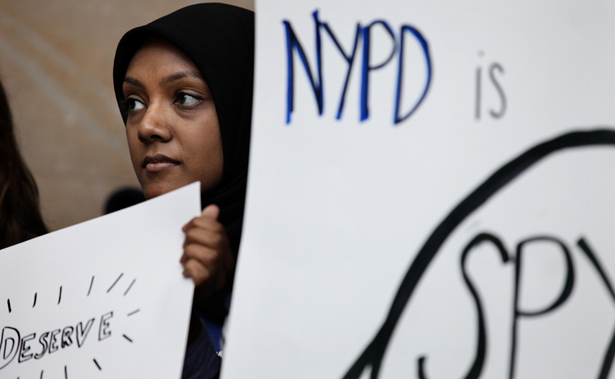 As detailed in “Mapping Muslims: NYPD Spying and its Impact on American Muslims,” a 2013 report published by a trio of legal rights organizations, the NYPD’s activities worked to create a climate of fear and suspicion in Muslim communities. Freedom of speech has been curtailed as Imams and other community leaders ask that members of the community refrain from political conversations, in case of informants. When it became common knowledge that undercover officers were frequenting certain Muslim-owned businesses, business dropped dramatically, inspiring some business owners to sue the city of New York. For Many Muslim-Americans, it all smacks distinctly of discrimination, a breed of profiling not altogether different from the kind experienced by black and Latino communities but with its own twisted DNA. “In no other setting would you say, ‘We think there is a white, male former army person who is going to do some harm. Therefore we are going to go to all VFW halls and places where white, Irish guys hang out,’” said Glenn Katon, legal director of Muslim Advocates, referring to the recent Kansas City shooting. The disbanding of the Zone Assessment Unit could signal the beginning of the end of this experience. But as long as the rest of the surveillance apparatus remains intact, it may be little more than a rebranding of the same old toxic tactics. Listen Next: Betsy Reed and Arun Kundnani discuss the surveillance of Muslim-American communities.